This image of IC 410 was captured in November 2006 by Adrian Brown. The open cluster NGC 1893 is embedded in the nebula. IC 410 is quite close to the Flaming Star Nebula and is part of the same complex. It was created from nine 15 minute exposures, with a 6 nm H-alpha filter. Adrian added some RGB data to colour the black and white H-alpha image. This colour data was 11 x 10 minutes Red, 7 x 10 minutes Green, and 7 x 10 minutes Blue, using Astronomik RGB filters. 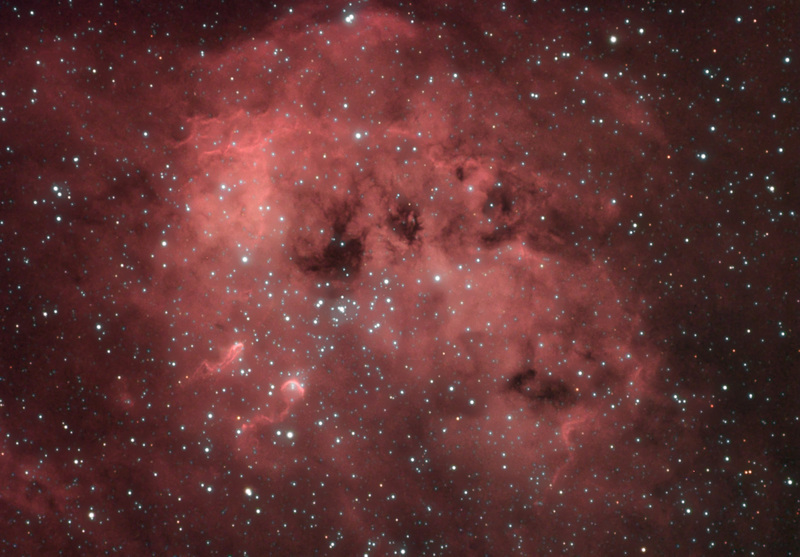 For imaging Adrian used an ATIK ATK16HR camera through a Skywatcher 80ED Pro refractor at f7.5. This was guided using an ATIK ATK-2HS camera through a Skywatcher 80T refractor. The set up was mounted on a Celestron CGE mount. Adrian comments: "Unfortunately, I did a poor job of focusing the colour data (I blame the seeing!) and the colour image had some very big, ugly looking cyan coloured halos around all the stars due to the focus being soft on the green and blue filtered exposures. I attempted to fix this in Photoshop using the 'Reduce Violet Halo' action from Noel Carboni’s Astronomy Tools add-on. I think it did a fair job of reducing the brightness of the halos. I’ll definitely try again this year  to get some better quality colour images and have another go at this nebula.". 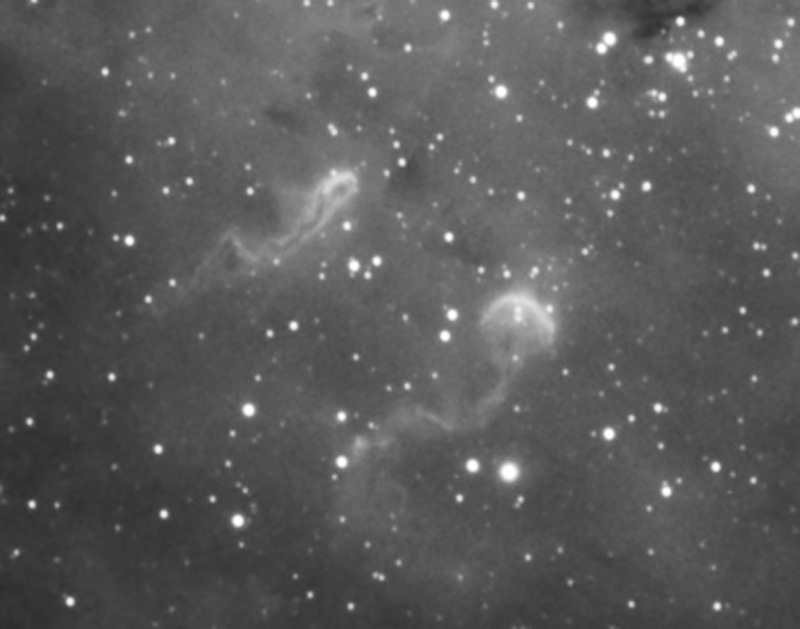 Here is an enlarged portion of the H-alpha channel of the above image showing the 'tadpole' structures in IC 410.